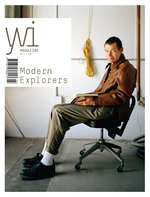 Yvi Magazine is a new English-language art magazine published in the Netherlands. Each issue of Yvi Magazine focuses on a central (social) theme seen from the perspective of art. A wide range of artistic visions on a pertinent social theme are brought together in the form of photography, design, architecture and visual art.